A steak dinner has beef as the main attraction and vegetables such as potatoes, mushrooms, asparagus and bell peppers as side dishes. A steak dinner can be homemade or ordered in a restaurant. The main factors affecting the amount of calories in a steak dinner are serving size and how much butter is included in the recipe. A steak dinner recipe that grills an 8 ounce rib-eye, bacon, red bell pepper, mushrooms and blue cheese contains 666 calories, with 485 coming from fat. 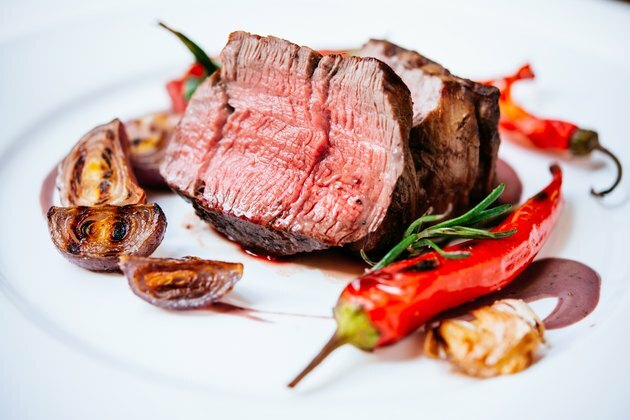 A popular steak restaurant offers sirloin steaks in portion sizes that range from 6 ounces and 332 calories, to 9 ounces and 445 calories to 12 ounces and 559 calories. For a complete dinner, add fresh steamed green beans and seasonal vegetables for an additional 200 calories. Different cuts of beef are fattier and contain more calories. An 8 ounce New York Strip has 407 calories, an 8 ounce prime rib has 537 calories and a 9 ounce filet has 725 calories. A serving size of meat is 3 ounces, according to the Cleveland Clinic. Steakhouses regularly serve dinners consisting of 14, 16 and even 20 ounces of steak. These pieces of steak have well over 1,000 calories and contain up to 37 grams of saturated fat.